No-bake Chocolate Oatmeal Cookies and I have a bit of a special relationship. I love how easy they are to make, and how rich the chocolate and peanut flavors can be. After such a great response from No Bake Chocolate Oatmeal Cookies, my brain started churning with other similar ideas. 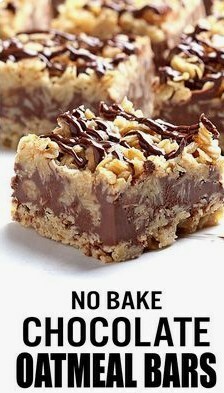 When I ran across these no-bake bars, I couldn’t believe I’d never thought to try making the cookies into bars. Melt butter and brown sugar in large saucepan over medium heat, until the butter has melted and the sugar has dissolved. Stir in vanilla. Mix in the oats. Cook over low heat 3 to 4 minutes, or until ingredients are well blended. Pour half of the oat mixture into the prepared baking dish. Spread out the mixture evenly, pressing down. Reserve the other half for second layer. To make the filling, melt the peanut butter and chocolate chips together in a small microwave-safe bowl and stir until it’s smooth. Pour the chocolate mixture over the crust in the pan, reserving about 1/4 cup for drizzling and spread evenly. Pour the remaining oat mixture over the chocolate layer, pressing in gently and drizzle with the remaining chocolate mixture. Refrigerate 2 to 3 hours or overnight. Bring to room temperature before cutting into bars. Note: Like any no-bake cookie, the final texture of these really depends on how long you boil the sugar mixture. If it doesn't boil long enough, the cookie/bars mixture will be too soft, if you boil too long, they could turn out dry and crumbly.